Major College Football Edges Closer To Playoffs : The Two-Way It looks like the sport is headed to a four-team tournament. Good idea? Alabama quarterback A.J. 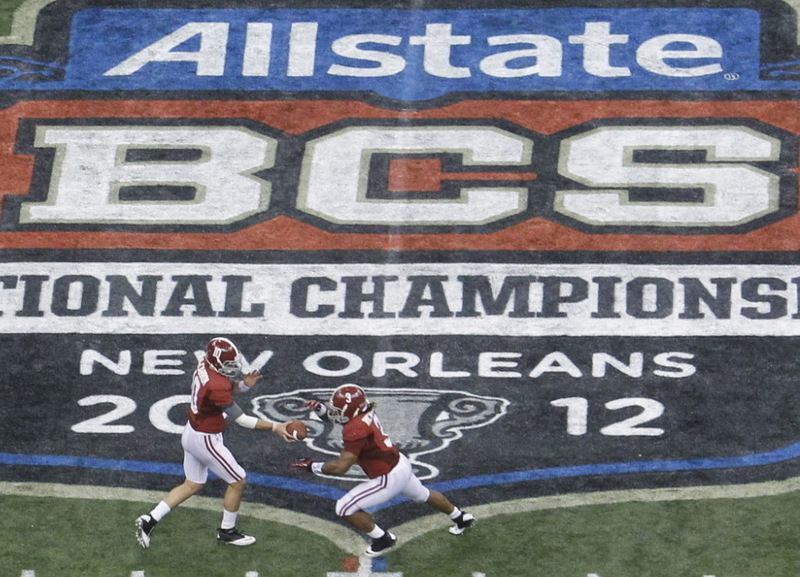 McCarron, left, hands off to running back Trent Richardson during the BCS National Championship college football game against LSU in New Orleans last January. "Major college football is on the verge of implementing a playoff, its own version of the final four — two semifinals and a title game," The Associated Press writes. "After years of defiant, hugely lucrative stasis, news broke Thursday that the major-college conference presidents and the Bowl Championship Series brass were moving forward with plans for a college football playoff that could pit the nation's (supposed) four top teams against each other as soon as 2014." The Journal adds that while several variations of potential plans are being considered, the general idea is that four teams would be chosen for the playoffs and that after the semifinal games "a championship game would be held at a neutral site—either an existing bowl or a site that bids in advance to host the game." USA Today's Kelly Whiteside dreams about what things might be like in a playoff world — semifinals played at the Rose Bowl and the Sugar Bowl, with a championship to follow at Cowboys Stadium. Details still need to be worked out, but do you like the idea of a four-team playoff in major college football? Note: That's not a survey of public opinion, it's just a question.